Courtesy of the Baltimore Theatre of Maryland website. A magical energy swept through the air as the audience spilled into their seats for Ballet Theatre of Maryland’s “Snow White” at the Maryland Theatre Hall in Annapolis, Maryland February 22nd through the 24th. Little girls dressed to the tens as princesses were proudly hoisted atop their fathers’ shoulders like queens being carried by their royal servants. Director and choreographer, Dianna Cuatto made her opening remarks which included a spoiler that the show would, in fact, feature a dragon. Little princesses in the audience gasped behind me serving as a reminder that I was in royal company. 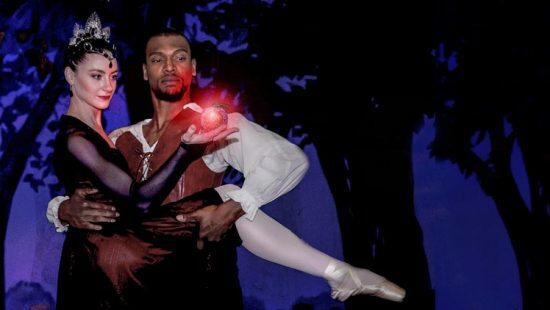 “Snow White” performed by the Ballet Theatre of Maryland February 22nd through the 24th make its debut at Maryland Theatre Hall in Annapolis, Maryland. The libretto and prologue set the premise for the tale in which the king (Broch Fowler) and queen (Madelyn Thomas) of a faraway land are blessed with a child whom they name Snow White (Emily Brennan.) Jealous of the news, the Queen’s sister, Queen Regina (Lindsey Hinchliffe) devises and carries out a plan to get rid of the Queen and inherit the kingdom herself. …the show served as an excellent taste for young audiences to become swept into the world of story ballets; thus ensuring that they will come back for more. The curtain opens and we are brought into Cuatto’s enchanting world where King William is hosting a ball as he prepares for war in a neighboring kingdom. Here we are introduced to key players in the story such as Queen Regina, her love interest, the Chief Huntsman (Stephaen Hood), and the Elemental Fairies (Lynne Bellinger, Nicole Kelsch, Karissa Kralik, and Jillian Conjura.) Before departing, the King asks Queen Regina and the Huntsman to watch over Snow White in his absence. Immediately after, Queen Regina usurps the throne and forces Snow White into servitude. The Huntsman and Queen Regina’s minions do her evil bidding in the lair where the Queen’s magic mirror is hidden. Trapped inside the mirror is Queen Desiree, who with the prompting of the Fairies, upsets the evil Queen by admitting that Snow White “is the fairest of all the land.” As an act of revenge, Queen Regina has the king killed and commands the Huntsman to slay Snow White. Meanwhile, Snow White meets Prince James (Jackson Kettell) and the two become smitten for one another. After a short-lived romantic encounter, Snow White leaves the prince and is greeted by a conflicted Huntsman who tells the princess to flee the kingdom. The young princess runs away only to be swarmed by creatures both kind and malevolent. The Fairies come to her aid and guide Snow White to a nice cottage owned by good-hearted people. Following intermission, Snow White meets her friendly new roommates, the seven dwarves (Alexander Collen, Brock Fowler, Jalen Williams, Chang-Hyun Seo, Ryan Massey, Sabrina Schulbach, and Hayley-Ann Vasco) and they happily reside in the cottage together. All the while, the Huntsman returns to the wrath of Queen Regina who realizes the princess is still alive and well. Determined, Queen Regina visits Snow White’s cottage dressed as an old hag where she poisons the princess with an apple that puts her into a deathlike sleep. The fairies gain word of this and alert the dwarves and prince. The prince fights off the Queen and her pet dragon before offering the princess true love’s kiss. The princess wakes up and releases her mother from the cursed mirror while simultaneously banishing Queen Regina inside of it. Snow White and the prince get married and live happily ever after. Likewise, the men were particularly strong with dazzling grand allegros led by the Huntsman (Stephaen Hood) and carried on throughout the ballet by the remaining male performers with the exception of Simple Simon (Alexander Collen) who acted as a particularly lovable, entertaining, goofy character. Equally impressive were the two remaining female dwarves who held their own with complicated turn sequences and fabulous petit allegros. Occasional interludes of young dancers were always welcome as every reasonable audience member can appreciate a bunch of little kids dressed as woodland creatures rolling around on the stage. The costumes, often reminiscent of Romantic-era regalia were especially stunning against a simple, albeit effective set. The pastiche music served the production well. However, I craved a bit more musicality at moments from the dancers (as demanded by the choreography) and felt the plot development lagged during the first act. Nevertheless, the show served as an excellent taste for young audiences to become swept into the world of story ballets; thus ensuring that they will come back for more. Running Time: 98 minutes with 20 minute intermission. “Snow White” performed by the Ballet Theatre of Maryland February 22nd through the 24th make its debut at Maryland Theatre Hall in Annapolis, Maryland. Click here for more information on the Ballet Theatre of Maryland.